The quarterback competition set to get underway in Bourbonnais will only make Trubisky better in the end. For the first time since 2009, the Chicago Bears will head into the season without Jay Cutler slated as the top quarterback on their depth chart. Cutler will merely be a memory but one with a lesson. The Angelo-orchestrated trade that sent Kyle Orton and an array of top draft picks in return for the gutsy gunslinger from Santa Claus, Indiana proved to be unsuccessful and highly costly in terms of roster development. Chicago thought they were getting the finishing touch, the last piece to the puzzle, le pièce de résistance. They crowned Cutler king before his feet touched base. Just some eight years later, third-year General Manager Ryan Pace – to a much lesser extent – chose to utilize a package of draft picks to make a move on a quarterback he saw fit for this franchise. Like the then-Bears General Manager Jerry Angelo, Pace, too, sees the importance of investing into the quarterback position for long-term success. Pace hopes his gamble proves to be a bit more fruitful. His choice to boldly move up for Mitchell Trubisky has been put to question by local and national media. What’s more, just months before trading up for Trubisky, Pace guaranteed Mike Glennon a hefty $18.5 million during free agency agreeing to a three-year, $45 million deal. Glennon surely felt cheated on. Now, just some twenty days away from the start of training camp, the excitement levels creep to an all-time high, who doesn’t want to see the second overall pick play? Here is exactly where Jay Cutler comes into play. Think back to 2009. Cutler, himself, was young. In a city like Chicago, expectations are through the roof and the inability to deliver only pegs the player. When Chicago shipped out a number of draft picks, they expected a return on their investment. Cutler came up short year one, throwing a league-high 26 interceptions. From there, the pressure only mounted and he came up shorter and shorter from thereon after. Upon his arrival to Chicago, Cutler had already experienced the highs and dramatic lows of the NFL – thus his availability via trade. Moreover, Cutler was the perceived finishing touch on a team led by the likes of Brian Urlacher and anchored by Olin Kruetz. Chicago soon realized it takes more than just a strong arm and bullish demeanor to win as a quarterback in this league. Cutler’s inability to stay healthy, his lack of leadership and consistency and an aging defense poisoned Chicagoan’s hopes for the return of the Lombardi. 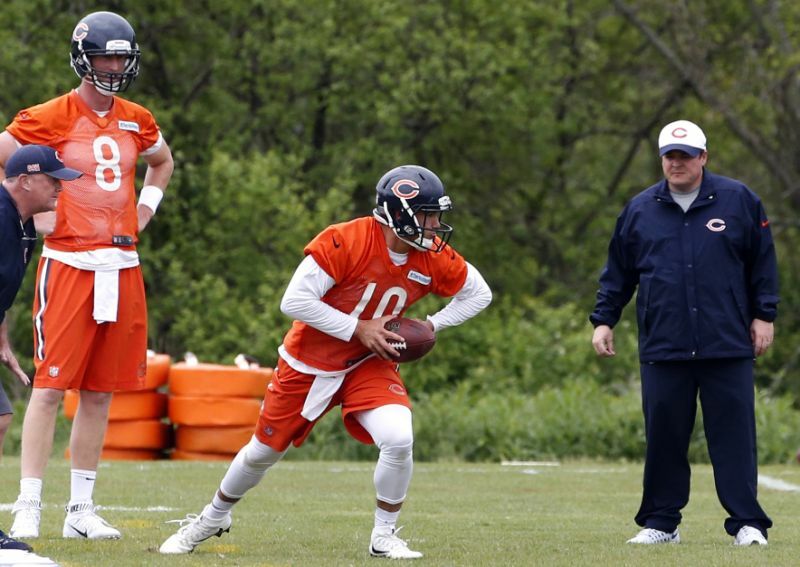 Pace saw a championship-caliber quarterback in the rather inexperienced Mitchell Trubisky; yet, he also realized the need to fully and correctly develop the quarterback both physically and mentally. The Chicago Bears are not on the brink of a championship. There is no trio of Urlacher, Briggs and Tillman with a ticking clock. This is not a team a few years removed from a Super Bowl appearance. This, in reality, is a 3-13 team. Embrace competition. The Bears have not had that word appear in their quarterback room during training camp since Grossman and Orton duked it out. The better man always wins and for right now that may be Glennon, but never disregard the idea of competition. We know Glennon will not bring Chicago a championship but he can at least make Trubisky that much better down the road. The Bears need to give Mitch and Mike both, a complete competition. This is not about the Mcaskeys $$ but about making the Bears GREAT and FEARED again.